The North Dakota Heritage Center & State Museum in Bismarck offers engaging experiences for students and teachers. Our programs and museum experiences are designed to help you meet North Dakota State Content Standards and also help bring to life artifacts, documents, and events found in the Grade 4 and Grade 8 history curriculums. To help prepare, check out ndstudies.gov and view a host of resources for grades 4, 8, and high school. Our State Museum website will also help you learn about the museum galleries and other spaces of interest in the ND Heritage Center. Learning Labs in the Adaptation Gallery: Geologic Time, the Innovation Gallery: Early Peoples, and the Inspiration Gallery: Yesterday and Today enhance your museum experience. Contact Visitor Services Coordinator Beth Campbell with questions: 701.328.2674. We want to meet your educational needs. Every teacher has a different goal with a museum visit, from learning about a specific area to an engaging fun day out of the classroom. All are welcome! Please let us know your specific educational goals, and we’ll do our best to meet your needs. We invite you and your students to experience HISTORY FOR everyone. No. The ND Heritage Center & State Museum is open seven days a week and always has free admission. During weekdays, the State Museum is open from 8 a.m. to 5 p.m.
On Saturdays and Sundays, the State Museum is open from 10 a.m. to 5 p.m. The facility is closed on state holidays. Where should buses and cars park? School bus drivers and chaperones can pull up to the east entrance loop to drop off students, then park in the new parking lot next to the glass atrium. Buses may also use the parking lot located on the north side of the building close to the Capitol building, and students may enter through the north doors. staff member will greet school groups near the east entrance information desk (by the large glass atrium) and provide an overview of our four museum galleries and additional exhibits. Find brief descriptions of our museum spaces in our Visitor Guide. Please view the Facility Map for an overview of the layout of the galleries. Our staff will show you where coats and other supplies can be placed during your visit, where restrooms are located (our most frequently asked question! ), and let you know about any new exhibits on display. Please keep your important belongings with you at all times. We want your students to enjoy a positive experience, so ask our staff any questions during your orientation and throughout your visit. If you plan on bringing student lunches, our staff can take you to your designated eating location. Please help your students clean up after themselves by using the provided garbage cans. Will our visit be a guided tour? A tour guide is not necessary, but you may request a general tour when you schedule your field trip. Due to limited staffing and many schools/classes coming to visit, we are typically not available to provide guided tours from mid-April through June. If you would like to explore a specific topic with a guide, we recommend planning your visit earlier in the school year. Three museum galleries are laid out in chronological order, covering events from 600 million years ago to what is happening today in North Dakota. Each gallery may be enjoyed with or without a gallery guide. Whenever possible, a gallery guide will be available in each museum gallery to provide guidance to the gallery and answer your students’ questions. To get the best overview of all four galleries, we suggest that you move chronologically from the state’s oldest history to contemporary times. The fourth gallery is the Governors Gallery and showcases temporary and traveling exhibits from around the world. Find out what is currently exhibited in the Governors Gallery. There are plenty of cool objects and interactive technologies available in each gallery to spark an interest in children of any age. From the life-sized T. rex skeleton cast to a Mars experimental spacesuit to “driving” a tractor to a mastodon skeleton, we hope to connect with all of your students. The State Museum hallways are also chock-full of interesting history, including Dakota—a rare dinosaur skeleton with fossilized skin, one of North Dakota’s earliest homemade cars, recent acquisitions, and more. What will we find in the Learning Labs? Three of our museum galleries offer an extended learning experience in the Learning Labs. Find out what is offered in each one! Whether you have 30 minutes or an entire school day to spend at the State Museum, you will find areas of interest for students of all ages. If you only have a short time available, our staff will help you make the most of your time by pointing out certain highlights. 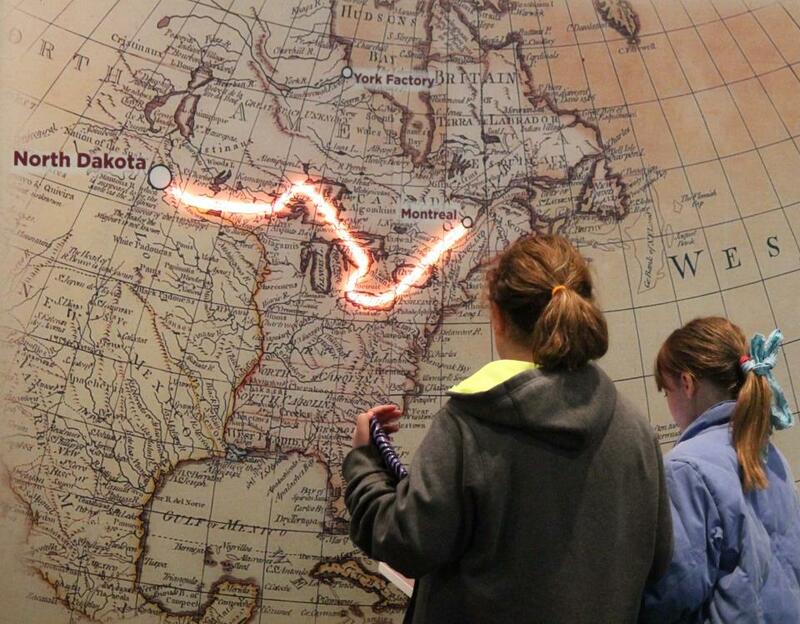 If you plan a day-long trip, your students can leave with a more in-depth understanding of North Dakota history. The ND Heritage Center is also home to the State Archives and State Geologic Survey, which also provide tours on occasion with pre-arranged visits. Since the Heritage Center is located on the State Capitol Grounds, you can also plan to visit the State Capitol, walk the Arboretum Trail, or release some energy on the expansive lawn. How can I best prepare my students for their museum visit? We suggest that you look at our website, ndstudies.gov, as a general class resource. Do you have worksheets or scavenger hunts available? Each gallery has an interactive white board on which you may lead an interactive activity or lesson. Staff are currently developing programs, activities and lessons for these boards. As we continue to develop resources, we appreciate teachers’ ideas about printed, online, and white board-based resources that would be helpful before and during your visit! Can students eat lunch in the building or purchase meals or snacks? Yes. The James River Café offers beverages, sandwiches, pizzas, cookies and additional snacks. Students with food allergies may wish to bring their own lunches. Classes may also bring lunches to eat in the Event Center or outdoors when weather permits. Please make the Visitor Services coordinator aware if you are bringing bagged lunches. If a teacher allows shopping time, students can spend time at the end of their visit in the Museum Store. The store features unique gifts and toys that teachers, parents, and kids will love. The store allows up to 25 students in the space at a time. Teachers and/or chaperones are expected to supervise students in the store at all times. What additional state historical sites can we visit in the area? For a list of all of our state historic sites, visit history.nd.gov. Teachers, please share these guidelines with your students and chaperones before visiting. For the best visitor experience, we recommend at least one chaperone for every 10 students. Be courteous and respectful of others who are visiting. Walk through the museum instead of running. Use inside voices and listen to museum staff as they help teach you about the museum. No food, drinks, and gum are allowed in the museum galleries. Be respectful of the exhibits. We want you to touch some things, but please only touch when you are permitted to do so. Do not climb or sit on exhibits or touch the paintings on walls. Take photographs! Suggestion: Snap a selfie with our sloth skeleton! Only pencils are allowed in the museum. Bring clipboards, and do not write on walls, windows, paintings, or exhibits. We want to preserve these for many years to come. We are interested in surveying teachers at the close of each visit whenever possible. It’s a quick and easy 10-question survey by a staff member. Please help us better plan for great student/teacher experiences, if asked to participate. Teachers are our best partners in enhancing student experiences at the museum! Thank you! Enjoy your visit to the the ND Heritage Center & State Museum!